Mark 3 "Fat Man" nuclear bomb exploded over Nagasaki at 1102 Hours at an altitude of 1,650 feet, dropped by Bockscar, B-29-36-MO serial number 44-27297, victor number 77, 393rd Bomb Squadron, 509th Composite Group. The primary target, Kokura, was obscured by clouds and haze from conventional B-29 raids. 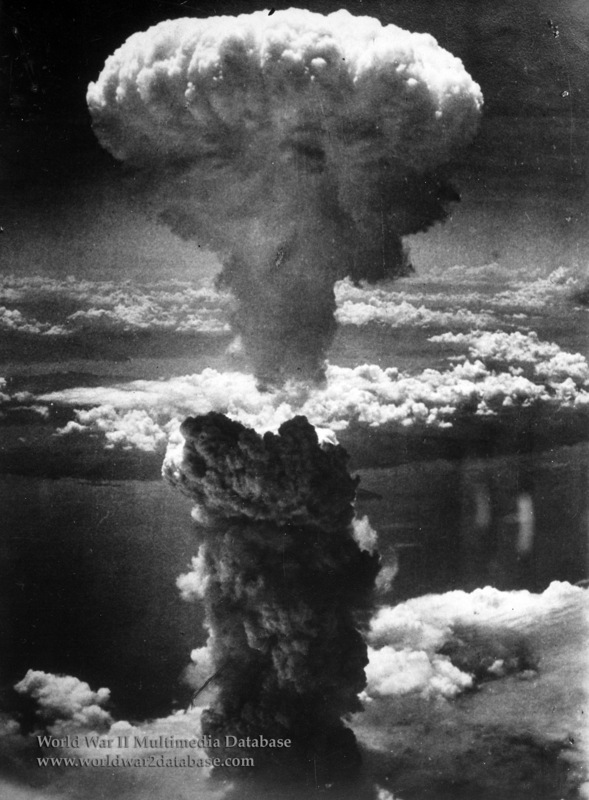 The yield of the explosion was later estimated at 21 kilotons, 40 percent greater than that of the Hiroshima bomb. Nagasaki was an industrial center and major port on the western coast of Kyushu. As had happened at Hiroshima, the "all-clear" from an early morning air raid alert had just been sounded. There were 200,000 people in the city below the bomb when it exploded. The hurriedly-targeted weapon ended up detonating almost exactly between two of the principal targets in the city, the Mitsubishi Steel and Arms Works to the south, and the Mitsubishi-Urakami Torpedo Works to the north. Had the bomb exploded farther south the residential and commercial heart of the city would have suffered much greater damage. Bockscar, virtually out of fuel, landed on Okinawa.